New stakeholders are entering the hospital arena, contesting the hospitals’ traditional role and freedom to provide care to the community. The newcomers’ focus is on digital care delivery processes and on a digitally enabled patient experience. Hospitals will have to start now to prepare their organizations for the coming change. Creating digital partner ecosystems is one prominent way to approach this task. Hospital stays can be frightening, stressful and sometimes traumatizing. As one hospital CIO pointed out recently: “We are throwing patients into our hospital machinery, removing their clothes and deprive them of their dignity”. However, more and more hospital executives increasingly acknowledge that a positive patient experience substantially contribute to promoting good physical, spiritual and mental health and thus quicker patient recovery. As hospitals around the world absorb between 30-40% of all healthcare costs, it is also crucial from a health-economic point of view, to re-think the way hospital care should be delivered in the future. An increasing number of digital, patient-centric solutions are already available today to remedy this situation. Some of them have been implemented in hospitals around the world to improve clinical outcomes and quality of care at affordable costs. A large number of hospital executives are pushing to implement these solutions to redefine care and implement digital care delivery processes, as well as a digitally enabled patient experience. In addition to the growing number of hospitals that are breaking new ground, new participants are entering the hospital care arena almost on a daily basis, challenging the hospitals’ traditional role as care providers to the community. On the one hand, these are to an increasing extent non-traditional players such as e.g. 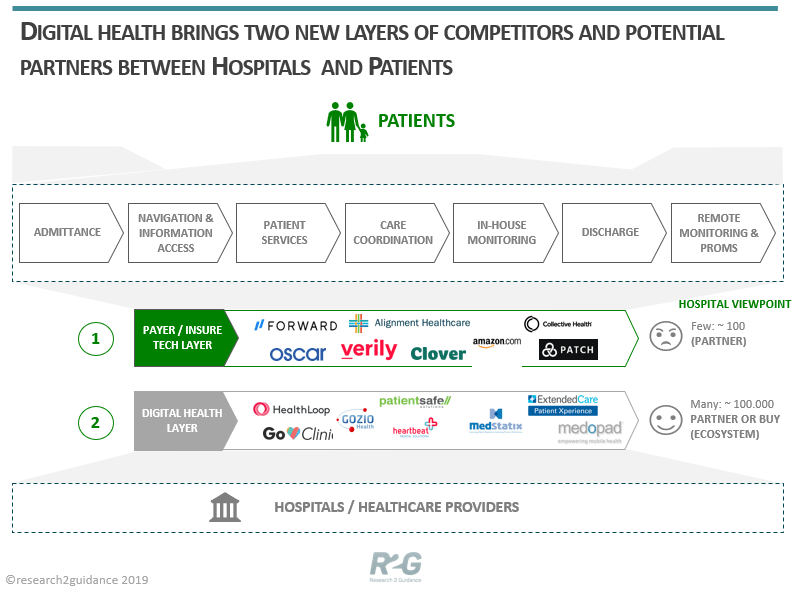 Google/Verily or Amazon, but also InsureTechs that are moving into the hospital and provider space with their digital offerings. In contrast, the digital health and app companies themselves intrude the hospital territory with their patient-focused app offerings. These new incumbents do not only threaten to take away parts of the traditional patient-relationship, but they will also be in a position to collect direct patient-data with which they are able to influence treatment regimens and thus may curtail the hospitals’ treatment and care autonomy. So what do hospitals need to do in order to face the challenge? Hospitals must start and build the foundation for digital or smart hospital structures and processes and invest in their digital transformation so that they can continue to master their own fates. They will need to manage business model change along with implementing new technologies. This will require delivering a new governance as well as a new organization which is supported by new technology. 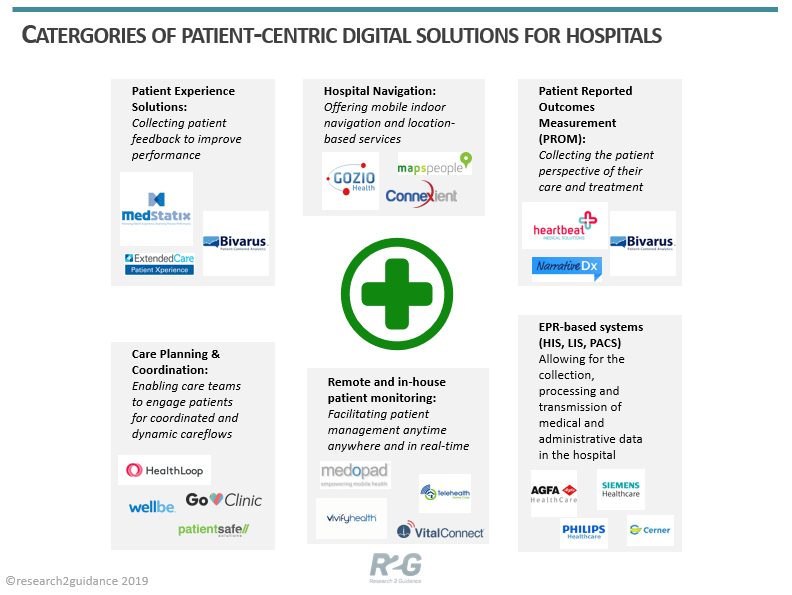 In the recently conducted global survey on “Success Drivers of Digital Health” (by R2G), a well-designed digital partner strategy and integration is among the top 3 success factors that enable to create value-added patient services that result in improved patient outcomes. However, with more than 300 thousand health apps available, building such an ecosystem of digital solution partners remains a great challenge for most hospital managers. Selecting the best fitting partners needs a solid screening and selection process, not only taking into account the app performance and safety, but also their capability to integrate into existing IT infrastructures and especially into EPRs. It is about the organization! Traditionally, hospitals have been built around different disciplines such as cardiology, oncology or internal medicine. Hence, there are little to no integrated care or cross-departmental processes, let alone a central patient data storage infrastructure. This is why – on top of all apps and solutions – it is mandatory to address the organizational and governance side of digital health innovation. Hospitals need to start now to prepare the grounds for bringing in digital health into the organization. The creation of an integrated digital platform with standard interfaces (which does not necessarily have to be the traditional hospital information system) that supports the new integrated care organization is a good starting point. With new participants entering the space, survival in the future will depend on a hospital’s ability to adopt, integrate and implement new technologies and create better services for patients. Reach out to us and find out how to create app partner ecosystems and integrate them into new and technology-supported organizations.